We've just made some improvements that were given to us by some Team and Individual sports photographers. We love siggestions. Keep 'em coming! The CSV uploader now includes the ability to capture data for two parents and give them separate passwords. This is especially useful if the parents are divorced and need separate access to the same galleries. Our popular GalleryMagic feature gets even more powerful! It will save you event more time by automatically creating your Team, Class or Group galleries from a CSV import. Soon we will be able to pull the images from the team/class galleries and place them in all the appropriate individuals' galleries. Stay tuned for that! And the last thing in this update, is the ability to export all the Student, Athlete or Subject data from our system in to a CSV which can then be used to automate your team and individual photography composites using software such as Pixnub. Our SortMagic high-volume photography app just got even easier and smarter! Now you can easily find a gallery in a long list by simply typing into our new gallery search bar. You can also add an email address when adding a gallery and we will turn that into a customer in your CRM, attach that customer to the event as a Known Customer and password protect the new gallery with that Known Customer's password so all that data is saved for you. After uploading, all your customers from the event will be listed and ready for you to mass email. Watch the video to see these two features in action. proofpix-SortMagicGalleryImprovements from Proofpix on Vimeo. The SortMagic App is born and it brings with it a simplicity never before experienced with high-volume photography solutions. The SortMagic App eliminates the tedious task of sorting thousands of images into hundreds of galleries for high-volume photography events without the need for unreliable QR codes or expensive, burdensome tethering equipment. The SortMagic App is part of the Proofpix family of services that allows a photographer to proof, sell and share their photography from one unified platform. The SortMagic high-volume photography app is available now! Click here for installation and instructions. If you use WHCC to fulfill your high-volume photography orders and you are shipping a bunch of orders to your studio, you may now consolidate those orders into one single WHCC order, making it easier to manage and a lot less expensive to ship for some items. Just use the Consolidate lab shipping menu on the Manage orders page to find eligible orders to consolidate and then choose the orders you wish to consolidate and press the Send to lab button. Easy. We are pleased to announce that you can request emails when someone tries to access a password protected event. Prior to this we would only ask for an email address when we needed to, primarily when a user wanted to save something to their Favorites or to their cart. Now the choice is yours. 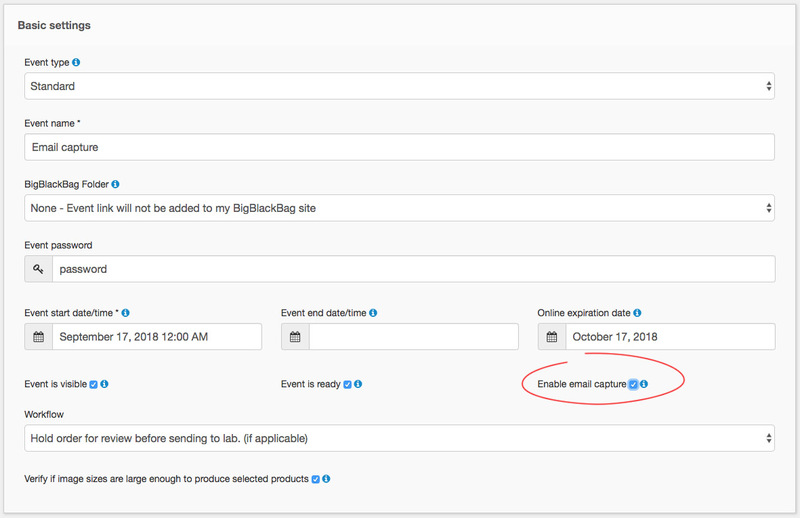 You can enable email capture in any Event's settings page. Please keep in mind, especially for European customers, that it may not be legal (or appreciated) to market to people just because they gave you their email.